"Protein and texture from the quinoa, sweet pockets from the squash and raisins. 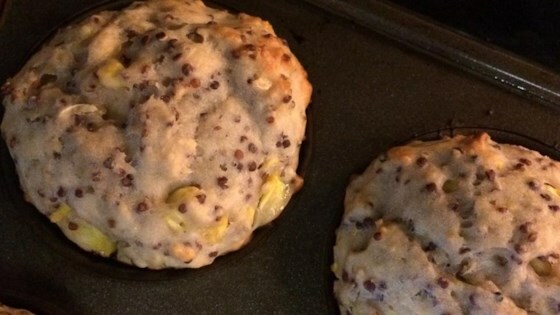 You can use any squash, cooked or shredded for these muffins. Enjoy." Bring water and quinoa to a boil in a saucepan. Reduce heat to medium-low, cover, and simmer until quinoa is tender and water is absorbed, 15 to 20 minutes. Preheat oven to 375 degrees F (190 degrees C). Grease 18 muffin cups or line with paper muffin liners. Mix all-purpose flour, whole wheat flour, cinnamon, baking powder, baking soda, cloves, nutmeg, allspice, ground ginger, and cayenne pepper together in a bowl. Stir squash, yogurt, brown sugar, raisins, walnuts, eggs, and vanilla together in a large bowl. Add flour mixture to squash mixture; stir. Spoon batter into prepared muffin cups. Bake in the preheated oven until golden brown, 30 minutes. Do you add the quinoa to dry or wet ingredients? Love these. I regularly send these in my kids lunches and it’s one of their favourites. I only use cinnamon when I am making them for the kids.